Hello and welcome back! It’s been silent around here for the last 2 weeks, because I’ve been bedridden with fever and stuff like that. But no more! I’m back on the keyboard and wrote up a tutorial on making Multiple-Choice Dialog in FlashPunk. This feature is of course implemented right into my JRPG Engine, that shouldn’t be a surprise to you. It’s pretty basic. The dialog texts are written and stored in XML files as assets. 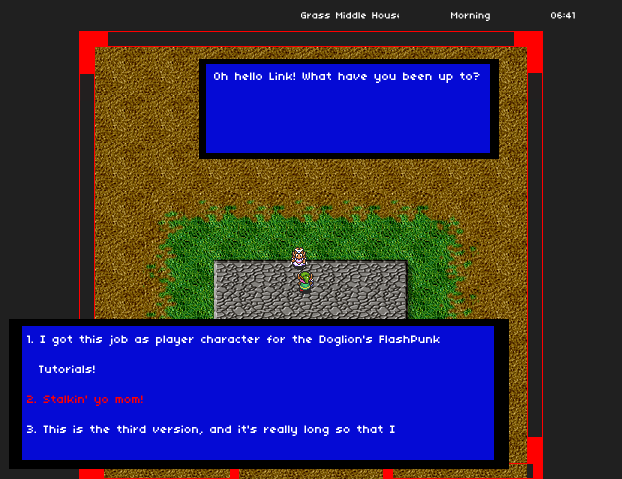 The engine allows for multiple dialog options and can make NPCs answer to the chosen line of the player. You’ll find out more in great detail throughout the article. The source code can be gotten from here. You can play the demo here. 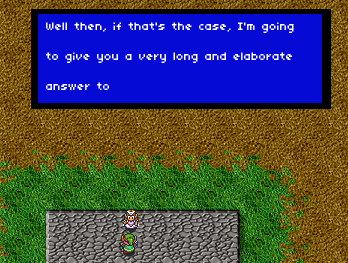 The dialog feature makes it possible for the player to approach an NPC and initiate conversation. Upon pressing the action button (Spacebar) while properly facing the NPC, the NPC can say something to the player (if there is any dialog data in the npc_data.xml). This text is displayed in a textbox, with word wrapping. If the text is too much to fit into a single textbox, the text is subdivided into “pages”, which are basically subsets of the entire current text, each fitting into a single page, so that they can be displayed properly. When pressing the action button, the next page gets displayed until there is no more text. Then it is the player’s turn and the player’s own dialogbox displays all possible answers as a list. The player can change his/her selection of what to say next, by pressing up or down. As opposed to displaying it all in pages, when there is more text than space, the dialogbox scrolls to properly display the current selection. As you can see, the attributes of the dialog tag indicate the other party, in this case “player”, which tells us this is going to be a conversation between Zelda and our player character. I’m hoping that I can somehow implement NPC to NPC dialog later on, for a cool eavesdropping feature. That’d be neat, eh? So anyways…the other attribute is the index of the dialog FOR THAT PARTNER. Which means that the next dialog with the player must be of index 1, but if there was a dialog with Peach, Zelda’s mother (I’m making this up, so bear with me), its index would be 0, and any consecutive dialog with Peach would increment on that. The code would still work if you didn’t adhere to this, but I think it’s better to keep track of things like this nonetheless. The dialog tag contains line tags within it. You see, it’s basically like this. When the player presses action to initiate conversation, the NPC says the first line, which is always its 0th line of the current dialog with that partner (the player). After saying that line, it’s the player’s turn to give a response, but because there can be several answers, each being on the same station/level of the conversation though, lines actually consist of “versions”, which are actual strings of dialog text. That’s why the first line of the NPC has only one version, since it isn’t a “dynamic” response to something the player said. Now when the player is at his 0th line and choses the second version in it, the NPC is going to answer with the second version of its 1st line (remember it’s zero based). So this is pretty much it on the data storage side of things. And versions is an array of simple strings. In the Player.as and NPC.as classes, there is a new property for each called dialogs, which is an array for objects of type Dialog. 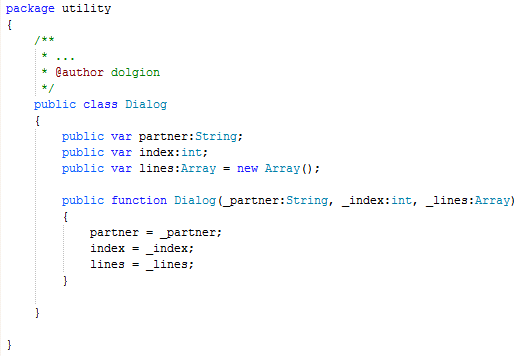 There are also 2 new dictionaries that help us with our dialog management, and the player has a new property called dialogPartner of type string, which is used when starting up a conversation, but I’ll get back to that later. The first dictionary dialogsInTotal uses the names of partners, such as “Zelda” or “Peach” as keys, and the values are ints that tell us how many conversations there are in total with that partner. The second dictionary dialogCounters also uses the dialog partner name as key, and the value is an int that tells us which dialog with that partner is next, so if there are 4 conversations in total with Zelda and the player, then dialogsInTotal has the value of 4, and if the first two have been gone over, then the dialogCounter would be 2. If the counter is equal to the total, that means that all conversations are gone over. I hope this makes some sense. So we check the direction the player is facing by clumsily using the curAnimation var (I gotta improve this code later…). 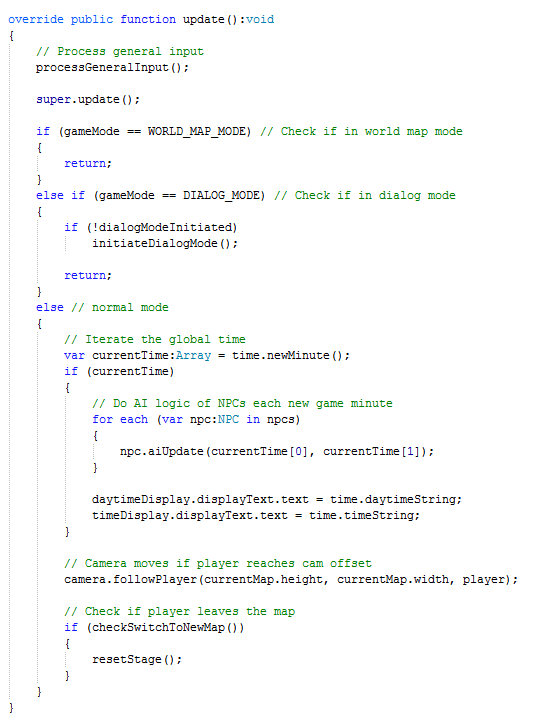 If in that direction there is an NPC 3 pixels away (using the collision detection method), then set the dialogPartner property to that NPCs name and set Game.gameMode to Game.DIALOG_MODE. We did the first step towards talking to other people! So there is this kinda new notion of “modes”. Dialog-mode, Worldmap-mode, Normal-mode and more to come. We want everything to freeze in dialog mode. We stop all NPCs from walking around, we stop the time from being updated and we don’t check if the player left the map or something. You also might’ve seen that in the Player’s update method, we don’t listen for movement keys if the game is in dialog mode. The Game.as class implements the dialog handling code in two places: the update method and the processGeneralInput method. In the update method, we check if we’re in dialog. The game mode can be set to dialog mode, as a reminder, in the Player.as class’ update function, so the Game.as class always has to check if the player did that. If that’s the case, we check if the new flag dialogModeInitiated is false. At start-up this flag is set to false, and so since the flag tells us that dialog mode is NOT initiated, we go ahead and invoke the new function for initiating the dialog mode. We check for the 3 buttons: action, scroll up and scroll down. When pressing action, we first check if there is another page in the npcDialogBox to display by checking if the current page is the last one. If it isn’t, display the next page. The next clause would be the NPC’s turn, at which we give the npcDialogBox the next line from the dialogManager, supplying the function the chosen dialog option of the player (0 would be the default, so we gave it in the initiation). To remind you, the NPC’s version of the current line is determined by the version of the player’s line immediately before. The last clause is the player’s turn. If the player’s dialog box hasn’t been invoked (for example in “dialogs” where the NPC just says one thing to you), it is now time to show it. Instead of setting the line of the player, like we do with the NPC, we set the lineVersions. We require all version of the current line, because we need to show them to the player as dialog options. It should be obvious. In case the dialog has ended and we end up in the else clause, we set the game mode back to normal, set the dialogHasEndedThisFrame flag to true, set the dialog boxes to invisible and the dialogModeInitiated flag back to false. 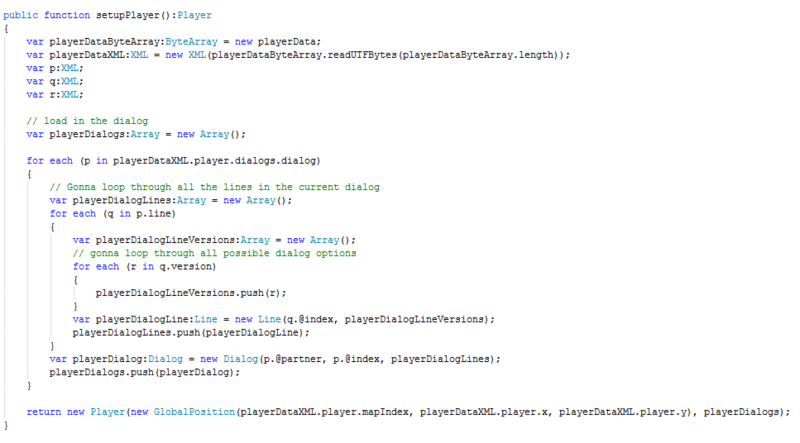 The selection_up and selection_down presses each call the playerDialogBox’s respective function, which will be explained later. It is to note that the turn is checked to be the NPC’s. This might look weird, but each time the dialog manager calls a nextNPCLine or nextPlayerLineVersions, the turn is switched automatically, so when we’re actually still in the player’s turn, the dialog manager already has the property switched. Okay, this is a pretty important class and you should know a good deal about it already. The dialog manager is what connects the Game.as class’ dialog boxes for NPC and Player with their dialog datastructures. Its job is ensuring that each dialog box gets fed the correct text for display and that the correct dialog is selected in the first place. The basic way a conversation works (at least in my game ;P), is turn-based. Link walks up to Zelda and presses action. She says something, Link then potentially gets to choose between one of several answers, chooses one, and Zelda says something according to what Link said. 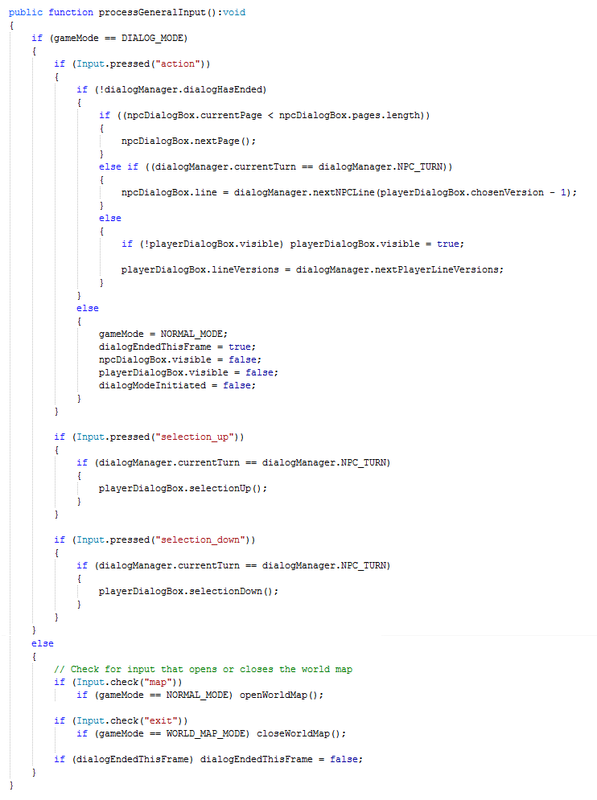 It’s not the kind of deep encapsulated dialog tree system you’d find when playing something like Dragon Age or so, but hey, it’s enough for the moment. One problem right now is that there is no backtracking yet, to try different dialog options to sort of get all possible info from the conversation. Anyway, the dialog manager manages dialog by keeping track of who’s turn it is right now, and feeding the text that is to be displayed in the Player’s or NPC’s respective dialog box. It also keeps track of the current “line”. 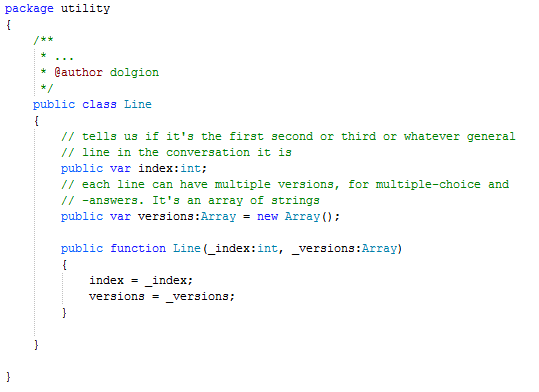 You’ll remember from the XML structure that lines tell us how far into the conversation we are at the moment. The first part of DialogManager.as that I’ll explain more elaborately is the function setCurrentDialogWithPlayer. The dialog boxes aren’t entities themselves, but they bundle the entities for the dialog boxes as properties. The first would be the background entity which is an instance of TextBox. 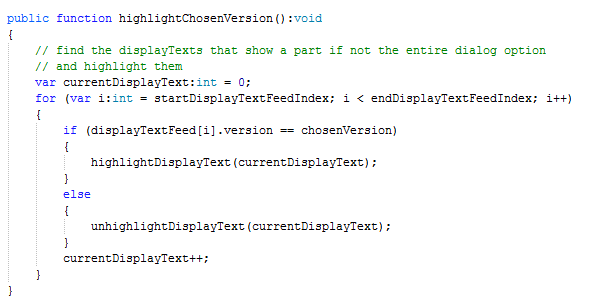 Then there is an array of DisplayText instances, called displayTexts. This array contains an instance for each row that is shown within the dialog box. Therefore, the number of DisplayTexts is proportional to the scale in height of the text box. The NPCDialogBox and PlayerDialogBox have different uses and therefore different code apart from this basic similarity. I’ll start with the NPCDialogBox. So this function has the task of taking the string given from the dialog manager and store it in the pages array. The pages array contains arrays that contain strings. It’s like this: a page is the container for rows. A row is an array of words. When the function takes the simple string of text as parameter, it is split by the spaces. Then the resulting array is stored as the variable “words”. 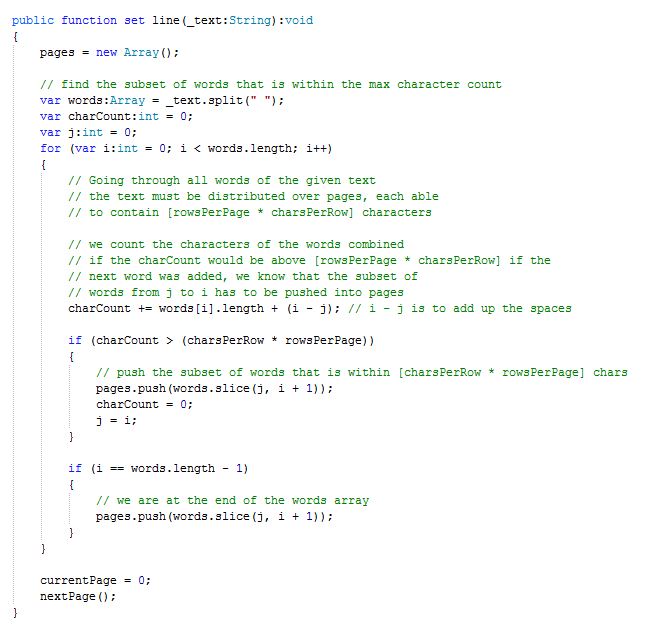 It is looped over and the charCount variable get incremented by the length of each word and the spaces. Each time the charCount reaches the maximum, the portion of the text since the last clip is pushed into the pages array, thus essentially becoming a page. The j variable gets updated to mark the beginning of the next portion, the charCount is reset. 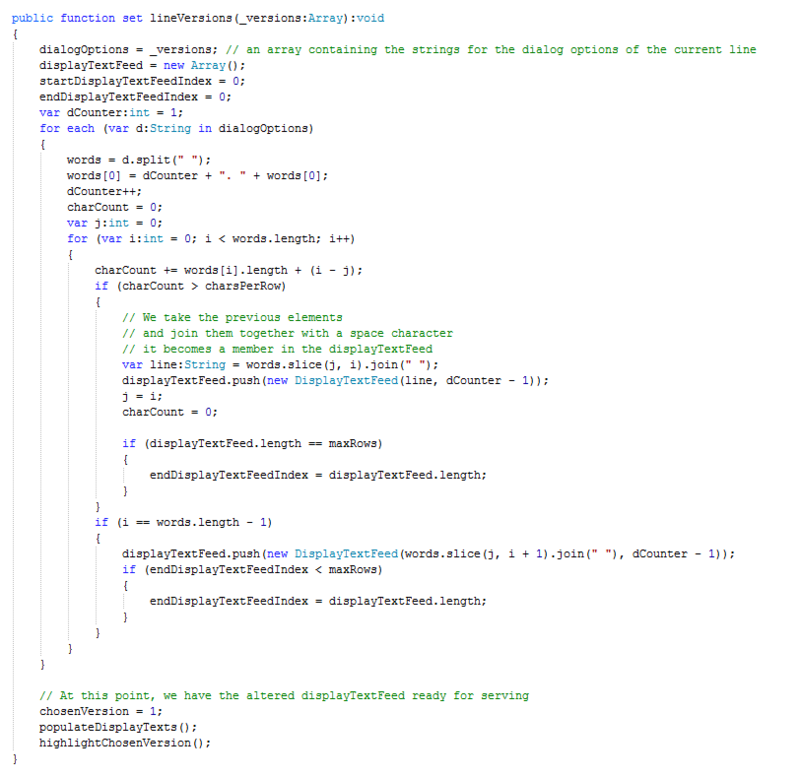 If the loop reaches the end of the words array, the last portion of the array gets pushed as-is into pages. After this is done, we call nextPage(). 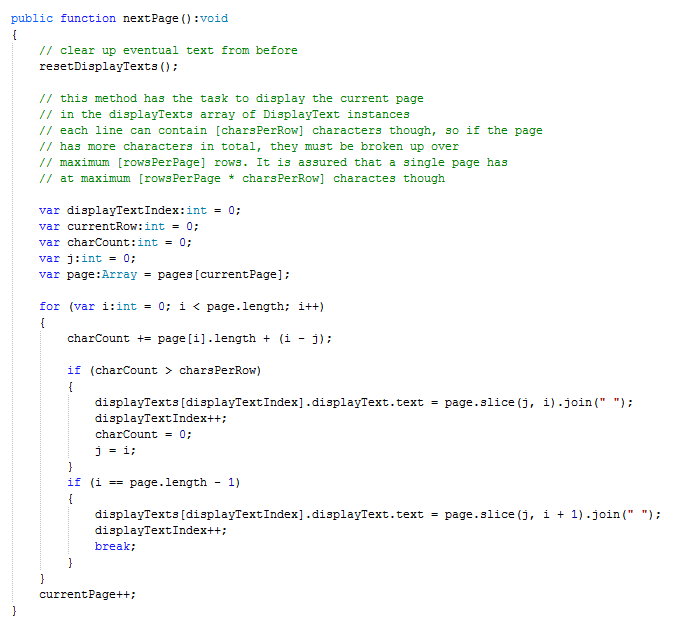 In nextPage we start off by resetting the display texts, and declaring the helper variables. It loops over the contents of the current page, with a charCount keeping track of the word lengths much like in the line setter function. When the starting and ending index that mark the words for a row are found, the subset is joined by spaces and set as the text for the current display text. What this does is it finds which words are next in line to fill into a row of text and then joins those words and set it as the display text’s text property. In the end, the remainder portion of the page is straight joined and displayed. Splitting the initial simple string of text into single strings and sticking them into an array enables us to get word wrapping. 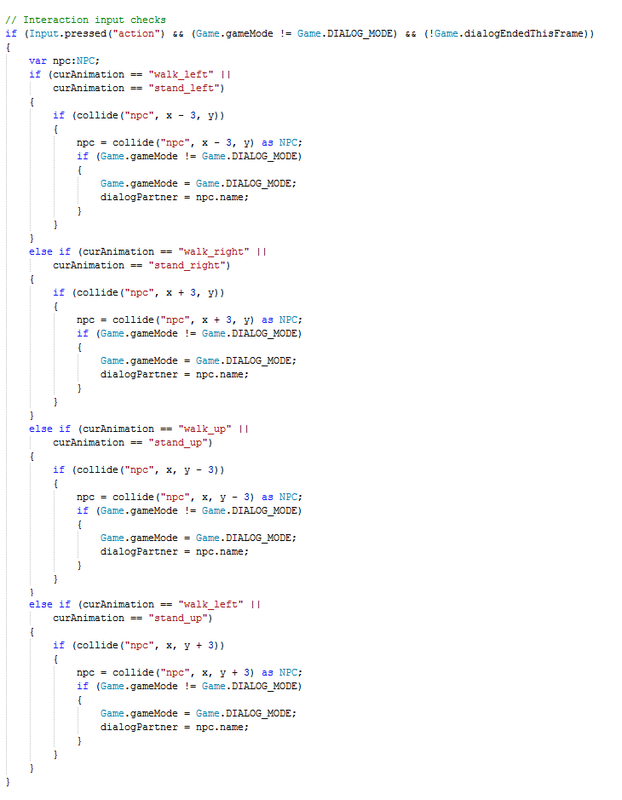 Sadly, the code necessary here is very convoluted and hard to read/debug/update, because of all the index counter juggling. One last interesting part of the class is the visible getter and setter. I wanted the dialog box to behave like an entity, where you can make it visible and invisible easily. So there is a boolean flag called visibility that simply says true when all the property entities are visible and false when they are invisible. The setter speaks for itself, I think. The PlayerDialogBox has the task of presenting the player with all dialog options he/she can choose from. Pressing up and down changes the current selection and can scroll the list to make sure it is fully displayed. Pressing action selects the current dialog option. Any single option must be at maximum (maxRows * charsPerRow) in character length. Anything above can’t be displayed at once. The constructor works exactly like the one in NPCDialogBox. Instead of the setter “line” method, we have the setter “lineVersions” method, which takes an array as parameter. The array contains strings, which are the text for a dialog option each. 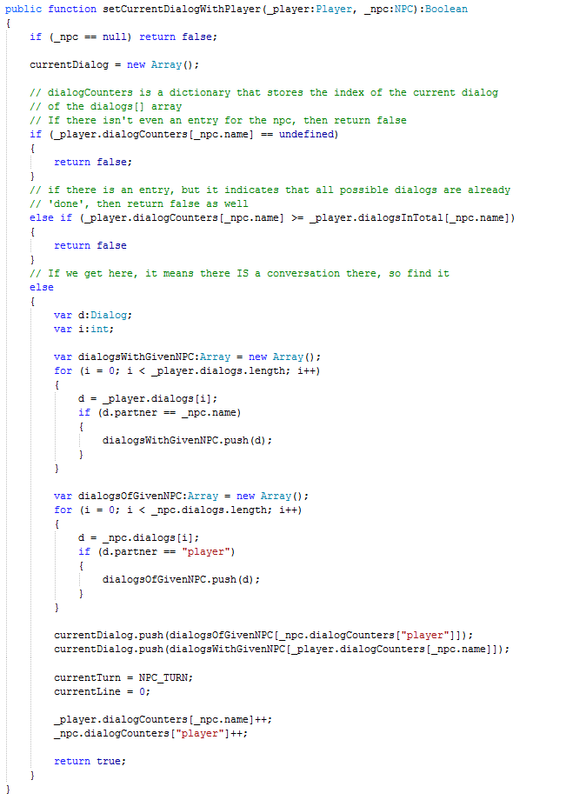 The class’ dialogOptions property is charged and the displayTextFeed array is initiated. 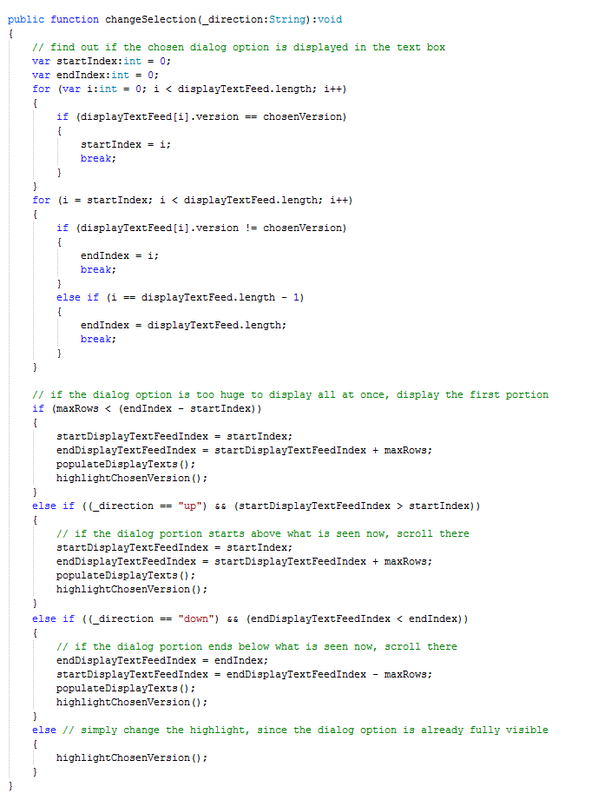 This array has the task of containing instances of the new class DisplayTextFeed. A DisplayTextFeed represents a single row in the list – its text and the dialog option’s index number (starting at 1). At the end of this method, all dialog options are fit into these display text feeds, word wrapped and properly indented/numbered. The two properties startDisplayTextFeedIndex and endDisplayTextFeedIndex tell us where the subset of displayTextFeed is, that is currently displayed in the display texts. The dCounter variable is a incrementing integer and marks the current version number of the dialog option. For example, if the first dialog option is “Good to see you too!”, then the dCounter is the prefix number that is added: “1. Good to see you too!”. It is also used to be the version value of any DisplayTextFeed instances for this dialog option. We loop through all dialog options, cut them in pieces by the space characters and fit them into rows, much like in NPCDialogBox. When a row has been defined, its text is joined back together and used to create a DisplayTextFeed instance, along with the dCounter. This instance is pushed into the displayTextFeeds array for later use. The class has the property chosenVersion of type integer that indicates the current selected dialog option. A value of 1 for example means the first dialog option, since it starts at 1. After all this is done we call populateDisplayTexts and then highlightChosenVersion. populateDisplayTexts takes the startDisplayTextFeedIndex and endDisplayTextFeedIndex to find the subset in displayTextFeeds that is to be shown in the display texts. It checks in the loop whether the current row is the first row of a version, by looking if the first character is a number prefix. If it is, nothing special happens, but if it isn’t, the row gets an indentation. This isn’t necessary but I find it prettier this way. The highlightChosenVersion method loops over the display texts and checks whether a row is part of the current chosen version, in which case the display text gets a red font color, and white if it isn’t. The last part that is a bit more complex is the selection functionality. The selectionUp and selectionDown functions change the current chosen version, and highlight the corresponding display texts. If need be, the subset of displayTextFeeds is adjusted, too, in order to properly show all the rows belonging to the selected version. In changeSelection we first get the startIndex and endIndex of the portion of displayTextFeeds that marks the selected version. Then it is checked whether there are more rows than possible to display at once, in which case only the first rows are displayed. If that isn’t the case and an upper part (when going to an earlier version) or lower part (when going to a later version) is not visible, the startDisplayTextFeedIndex and endDisplayTextFeedIndex variables are updated accordingly. If none of those cases apply, the highlight is simply updated to properly highlight the new selection. So this is it for now. 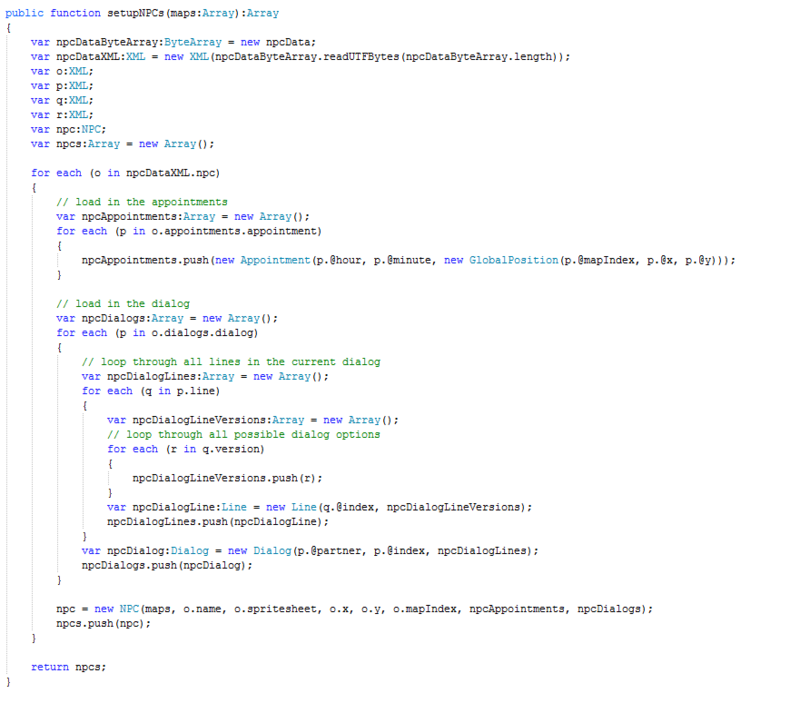 There have been some other changes in the code, but those are mostly just refactor changes. The dialog feature is by far not complete yet, but at this stage of development, I can work well with the feature as it is. The only necessary addition I’d need to make is to allow for going back to previous lines to try different dialog options. Anyways, I hope you liked this tutorial, and hopefully it was useful and understandable. These articles seem to get larger and larger each time, and my explanation skills probably aren’t that great. So if you have questions or feedback to give, please do so. I’m pondering on what to do next. I think next up is gonna be a menu system with inventory and stats and stuff of that nature. It should be a hell of a lot of work, hehe. If I’m not getting into any other illnesses etc, I should be able to work on this from now on pretty steadily. So, until next time and see ya! I’d really like to check out the full source to the classes so that I can more fully understand the way that it all works together. If you could make it available or send it to me directly, it would be greatly appreciated. Hi Richard, glad you liked the article.